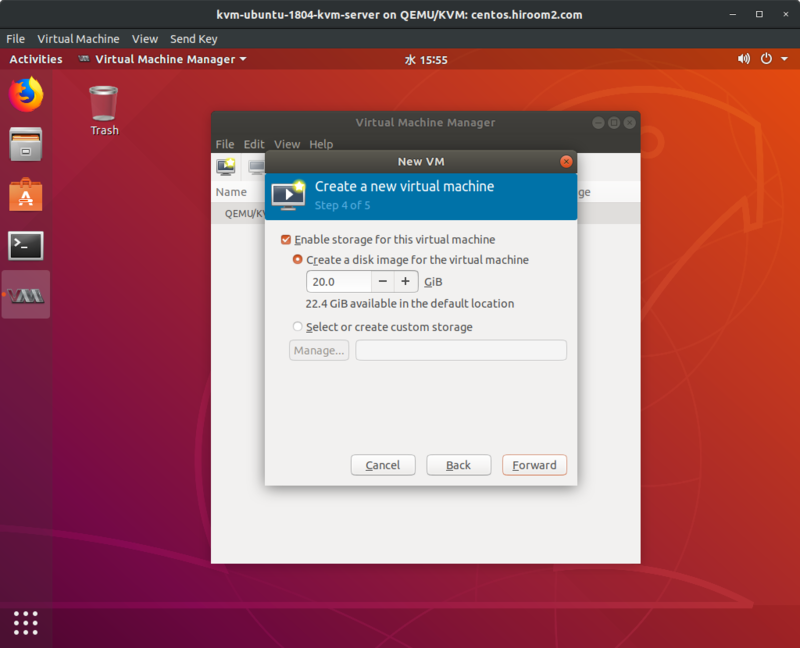 The bridge interface is needed for accessing virtual machine via network from other machine. The user in libvirt group can run virt-manager and virsh without sudo. 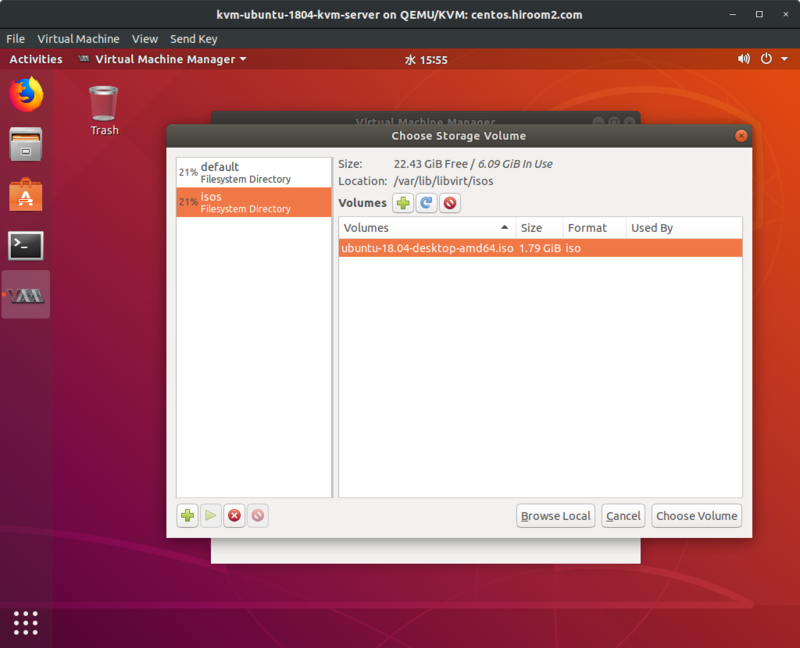 virt-manager and virsh provdes remote access via SSH. If you uses SSH public key authentication, you can omit inputing password. Create SSH keys on client which uses remote access via SSH. Add SSH public key entry to ~/.ssh/authorized_keys on server which is installed KVM. Specify server URI with -c option on client. 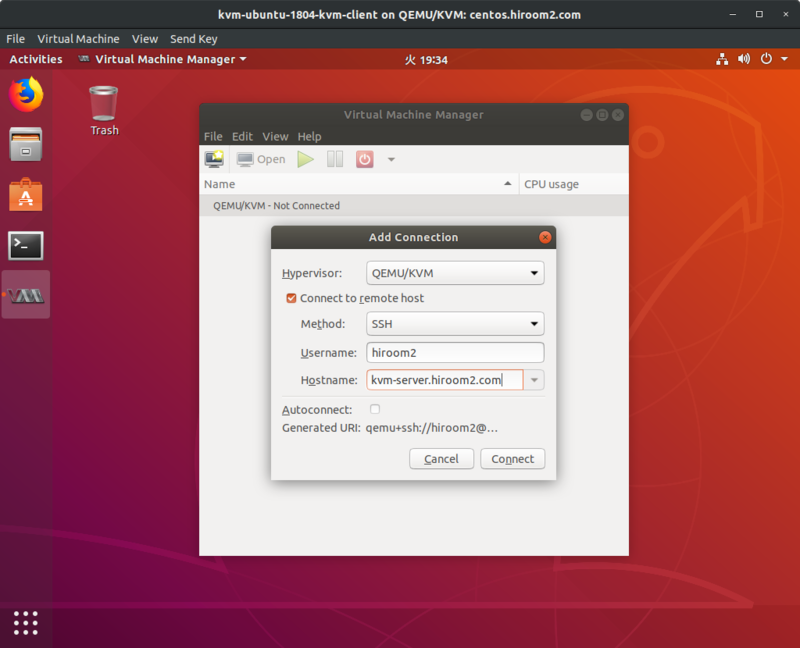 Setting server URI to VIRSH_DEFAULT_CONNECT_URI is equal with specifying server URI with -c option. Write VIRSH_DEFAULT_CONNECT_URI settings in your .bashrc if you need. 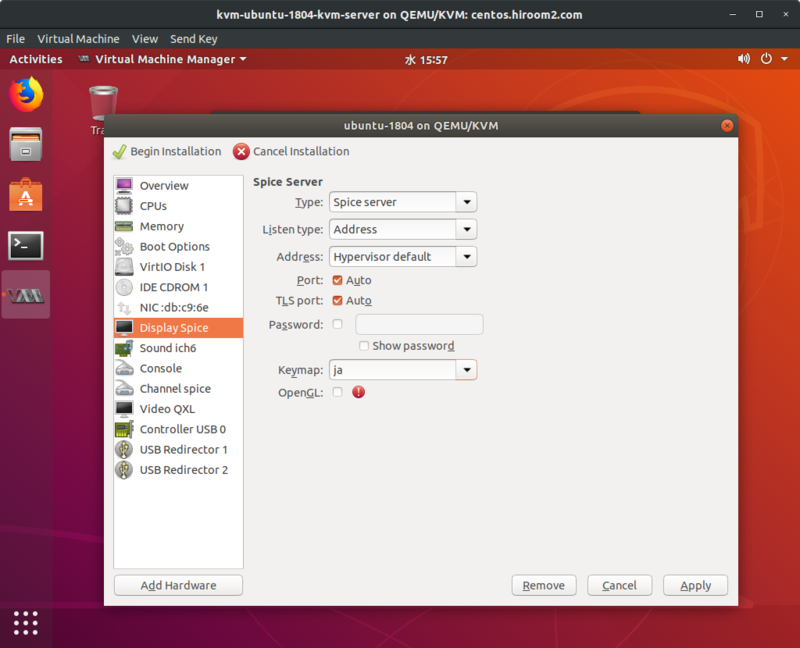 In case of virt-manager, click "Add Connections" and specify server. Download ubuntu-18.04-desktop-amd64.iso from this page and add a pool for ISO file at /var/lib/libvirt/isos. In case of virsh, use the following command. 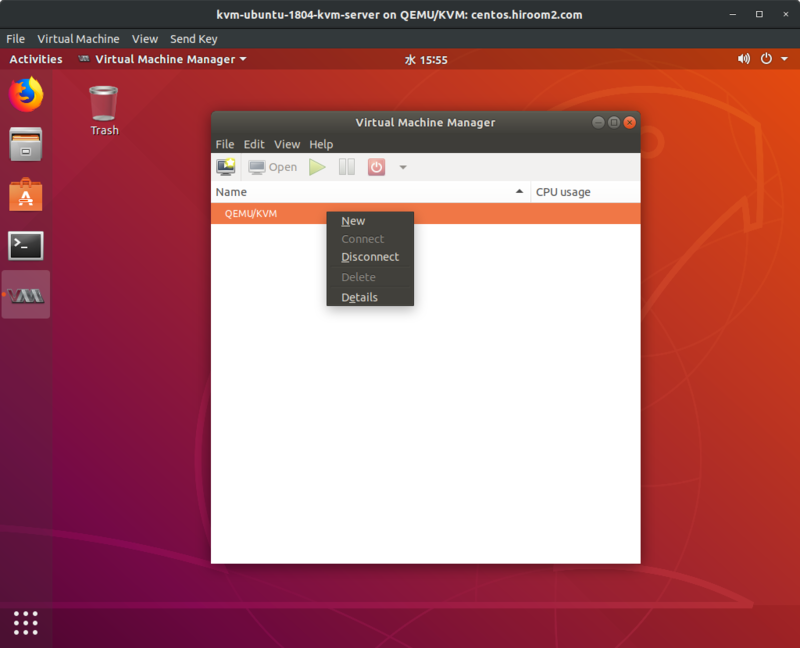 In case of virt-manager, left click on "QEMU/KVM" and right click on "Details". Add a pool with pressing "+" button at the below left. Input "Name" and select "dri:Filesystem Directory" at "Type". Input "/var/lib/libvirt/isos" at "Target Path". The pool for ISO file is added. 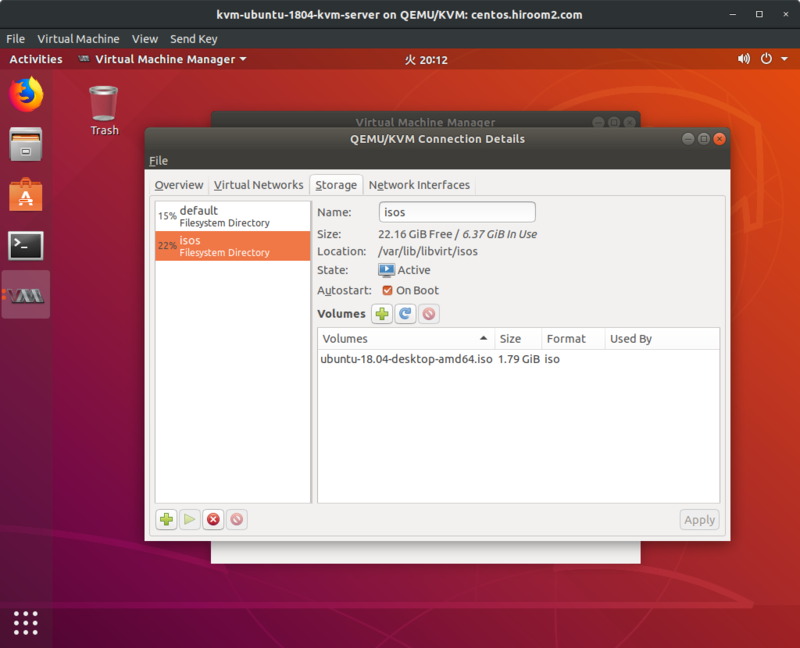 Left click on "QEMU/KVM" and right click "New". Select "Local install media" and click "Forward". Select "Use ISO image" and click "Browse". Select ISO file in "isos" pool and click "Choose Volume". 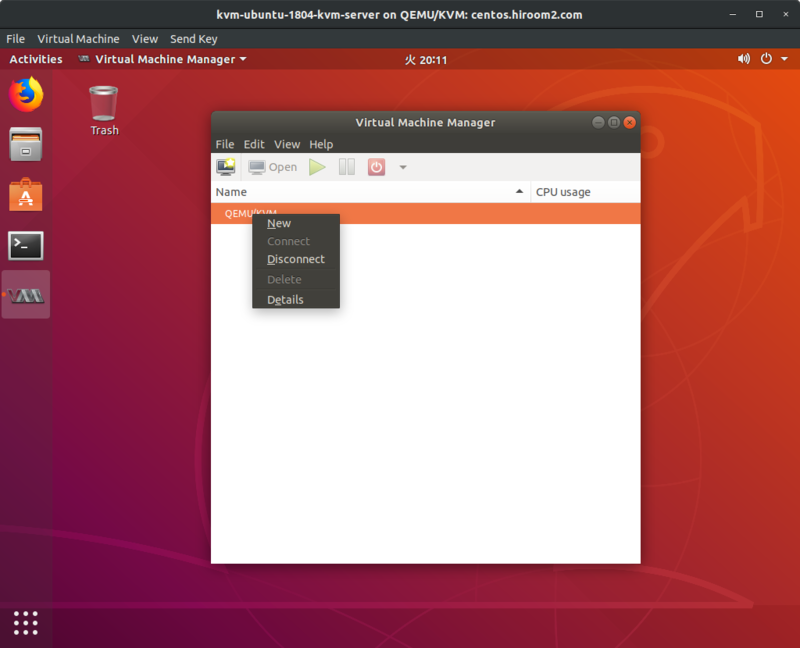 If "OS type" and "Version" is Unknown, select these manually. 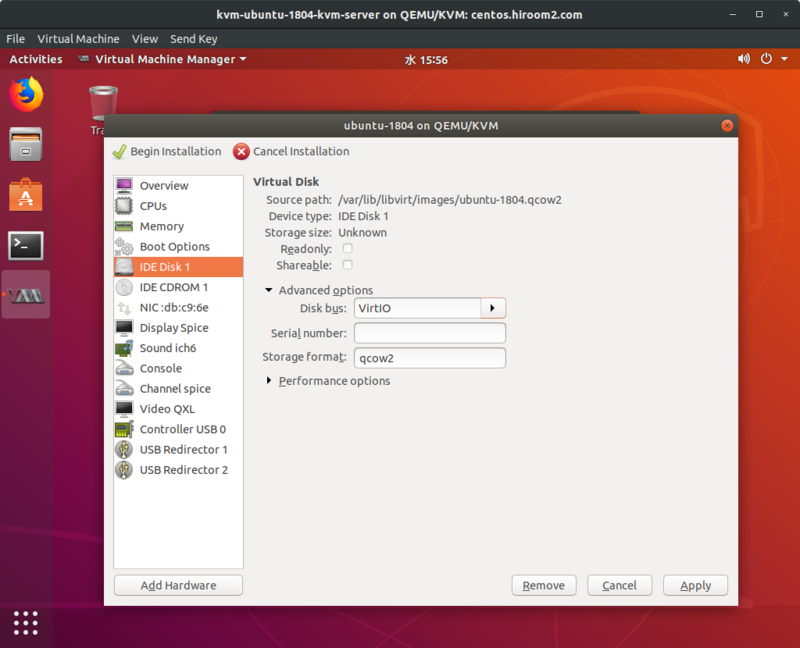 In case of Ubuntu 18.04, select Linux as "OS type" and nearest version of Ubuntu as "Version"
Input memory size and CPU number. Create storage. 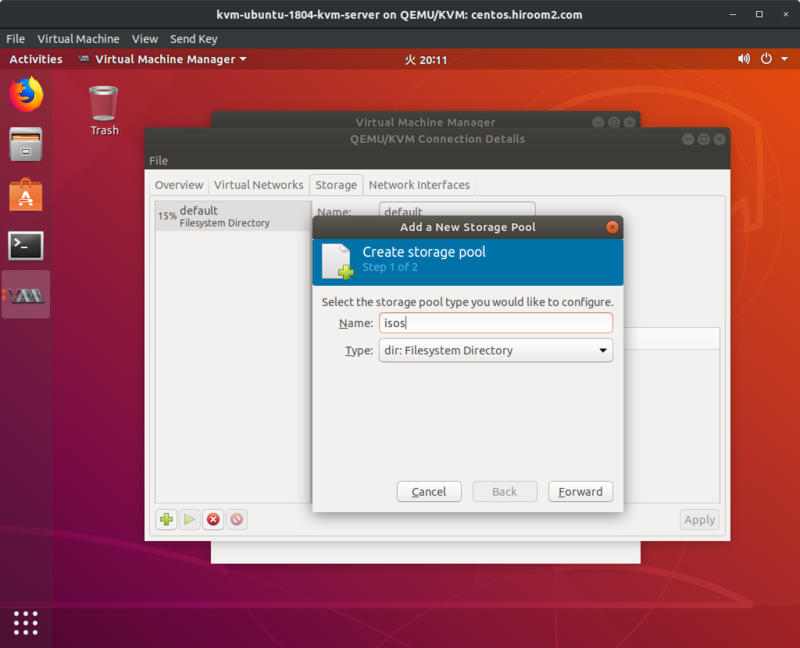 By default, storage will be created at /var/lib/libvirt/images directory which is "default" pool. Check "Customize configuration before install" for changing keyboard layout and storage type. Select network. 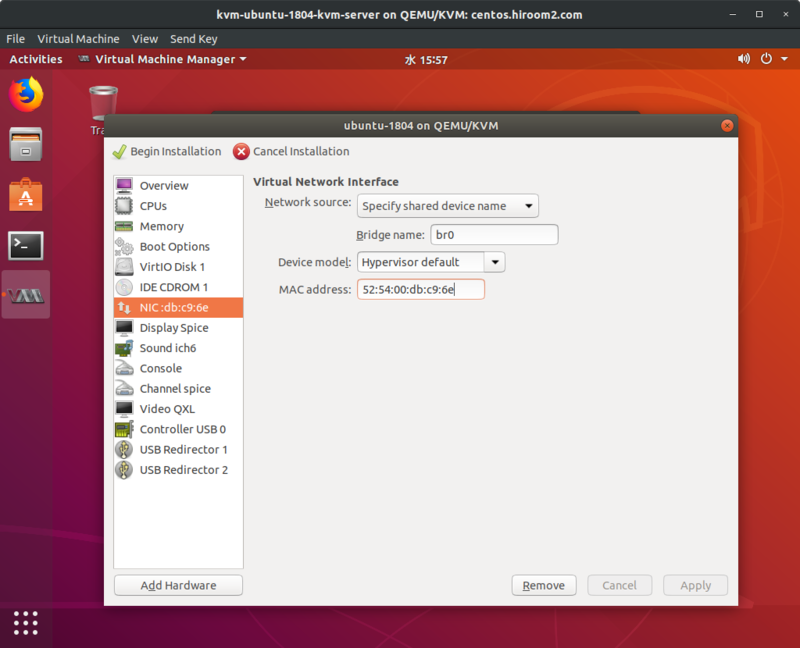 If you create bridge interface with nmcli or systemd-networkd, virt-manager does not display bridge interface. But you can use bridge interface with "Specify shared device name". Select "IDE Disk1". Set "VirtIO" as "Disk bus". Select "Display Spice". Set your keyboard layout as "Keymap". In case of Japanese, keyboard layout is "ja". Select "NIC". You can modify MAC address at this stage. Clicking "Begin Installation" starts installation. 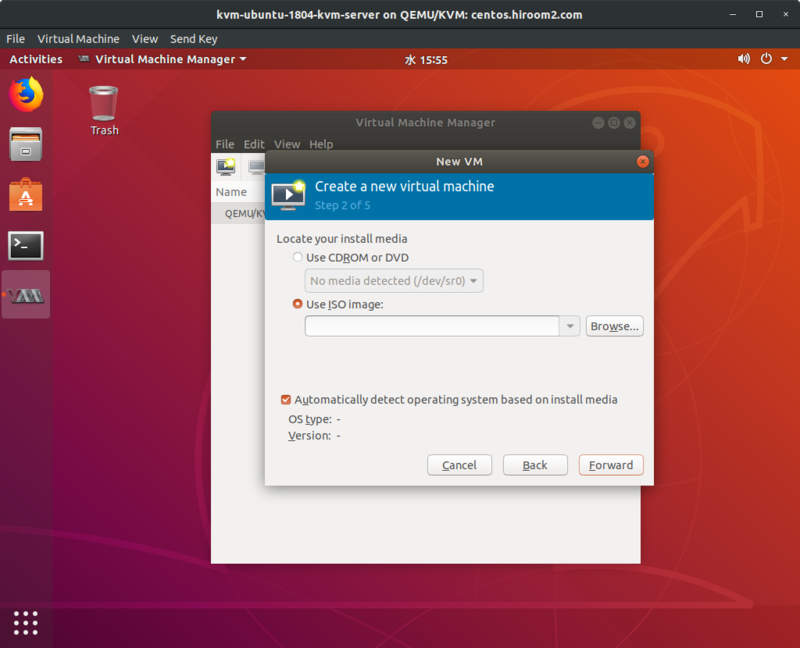 Install OS with the same way as physical machine.